Route:Indoor Stadium-SMJA-Jalan Kebangsaan--Sungai Akar Highway--H.Bolkiah Highway-- Tungku Link -- Muara Tutong Highway--Bukit Beruang --u turn towards Muara-- u turn Muara roundabout -- back to stadium through berakas(lambak). That was the planned route but due to miscalculation of the distance and a lot of the cyclists don’t have the energy (but still has the heart to go for it), the route was shorten up to Perpindahan Lambak and back to Stadium instead of going all the way to Muara. If we decided to go to Muara, most probably our meter reading would read around 180km. The ‘Chief Organizer’ Sofian Thani giving last minute briefing before the ride. Around 35 cyclists showed up for the challenge including 2 cyclists using MTB with big tyres. Jalan Kebangsaan (7:22am) and everyone was still happy and smiling. 8:25am, taking a break at Bukit Shahbandar. Everyone was still happy and a few complaining that it was too fast. Tutong Highway (8:38am) which was around 26km to Tutong Mall and along this stretch of highway, is where the challenge really begin. Just after the JP bridge, someone got a puncture, at first the whole group stop but after a few minutes they decided to go on and to meet up at Tutong Mall. After that a few more cyclists got punctured tyres. After the break at Tutong Mall, a few (more-lah) decided to end their journey and a few decided to wait at Pantai Seri Kenangan to wait for the cyclists that continue their ride to Bukit Beruang and back. Taking a break at Pantai Seri Kenangan Tutong. By this time 11:21am, less than half already gone. I was still doing fine. After this, no pictures were taken because I was too tired and my leg was already giving up on me. The ride from Pantai Seri Kenangan Tutong to Pantai Jerudong was very hard and alone. At Tasek Biru Police Station, I’ve decided to take a break along with Mike, Zarin and John. I needed the break, it was very hot and I need to massage my leg. John have to end his challenge at this point due to his tyre was severely cut/injured by sharp object. I had a bad cramped on my right thigh. Sometime it is not a good idea to stop when a cramped occurs. Just continue riding, do some spinning (high cadence) and if that doesn’t work, change to a heavy gear (not to heavy lah), and hopefully it will go away. What I’ve noticed is, it doesn’t matter how much you drink electrolytes, isotonic, ORS (oral rehydration salt), Powerbar GEL, Dencorub HOT massage,banana, Cramp spray, if you don’t have enough training, rest, recovery period and most important the fitness level, you gonna get cramped. 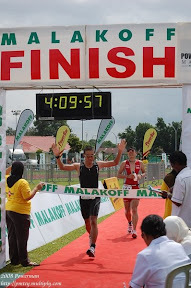 In conclusion, my fitness/endurance level was only until 90km and an additional 10km without cramped. After that, the leg cannot take it anymore. Thanks to Mike and Zarin for escorting me from Tasek Biru to Pantai Jerudong. Most of us had a small/big cramped. I think the only person that didn't get a cramp was Sofian Thani. He was in a good shape and his fitness level was above us all. Salute !!!!! At Pantai Jerudong, I guess there were around 13 cyclists ( I think so lah) which include Aliuddin, Zaeidi, Ahmad Fathi, Mike, Zarin and his friend, Shariff, Azizul, Sofian Thani, Boon Teck and friends and maybe a few other cyclists yang inda ku tau atau inda ku nampak. The road along Perpindahan Lambak Kanan all the way to Berakas Secondary School was very very windy – a strong wind coming from the front. This was not helping at all. When I reached at Indoor Stadium, I think it was around 2:30pm, there were Ahmad, Aliuddin, Azizul, Sofian, Zahrin and his friend. Zaeidi was no where around. He should be at the indoor stadium before me. Aliuddin call him up and he said he was doing a few more laps around stadium to complete the challenge of 160km. So we (Ali and me) decided to round up the number from 147km to 150km. Actually Aliuddin managed to get 151km. The rests of the cyclists decided to headed home directly leaving their car behind at Indoor Stadium since their home was along the route. and in return a good experience torturing day. I wouldn't say it was fun lah. It was Challenging. Next year, if the 2nd Anniversary Ride for Cycling Buddies is still a Century Ride (160km), then I hoped we will be given at least 2 months advance notice, so that I can practice and complete the challenge with ease. Lastly thank you to Sofian Thani, the creator of Facebook Cycling Buddies - The Organizer and to those who have contributed the ideas and suggestion for the Century Ride. Next week, Cycling Buddies Anniversary Ride - OFFROAD STYLE. So to those interested in joining the ride, please be at McFarm parking lot by 6:30am. Bring along your MTB with your spare tube, Hydration Bags, Powerbar Gel, Basic bicycle tools. Most importantly do not leave behind your sense of adventure and fun. Without it, you gonna suffer BIG time.